8 Dos And Don’ts For The Sari Virgin! Are you finally trying your hand at wearing saris? Maybe it’s your college or school farewell, or another social event, the time is here and we know you’re looking forward to turning out just perfect as a sari debutante! It may seem like a lot of work when you see your mom walking around in it and you are very apprehensive whether you will be able to carry it off gracefully, or ruin the whole look. We’ve got your back now! 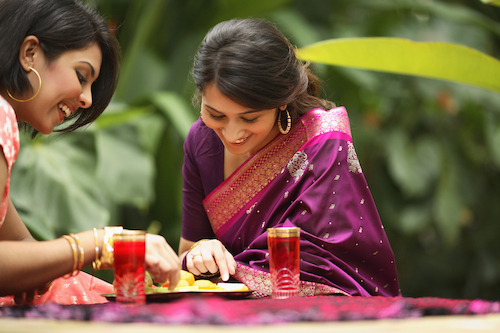 Here are few things you should keep in mind when you plan to wear your sari. 1. Pick a fabric that is easy to handle! It’s your first shot at wearing a sari, thus we suggest that you pick a fabric that is easy to handle. By that we mean pick a saree in silk or georgette, rather than a satin or a starchy cotton one. Once it’s all tucked in it won't bother you and you can walk around freely. Plus, since these are softer materials, in case something gets yanked out, it’s easier to tuck and pin into place rather than slippery satin or starched cotton, which can give you more trouble to fix. 2. How much skin do you want to show? The sari is something in which your mid torso is visible to everyone and that’s why it’s important to be sure of what you are comfortable with. Wearing sheer fabrics will reveal more of this compared to fabrics that are opaque. You can choose the blouse length and cut also accordingly. You have to be able to carry it off confidently, thus you need to be happy in the sari! 3. Safety pins will be your best friend! Use safety pins to keep everything in place. A bigger pin where the pleats start, so that once you’ve tucked it into the petticoat, it doesn’t move. Another one to keep that pallu in place - use it about one inch on the back where the shoulder joint ends so that it looks neat and the shoulders don’t look bulky. Try and limit yourself to two pleats because beyond that it starts looking like you’re having a tough time carrying this off! 4. Tighten that petticoat very well! Breathe in and hold it there, now tie your petticoat above (or just below) the navel very tightly. It might seem very uncomfortable, but trust us, with every minute this keeps becoming loose and thus you need to bear this discomfort for the time-being. Once the petticoat is in place, the sari will remain intact too. This is where many girls go wrong. Tying the petticoat too far below the navel means it’s quite likely that the sari will start drooping, so you need to avoid that. 5. Do you want to wear heels too? Yes, we understand you love wearing tall heels, but we suggest that for the first time, you choose the heels wisely. Try wearing comfortable wedges or tiny kitten heels so you have one less thing to worry about. Walking around in a sari might be a difficult and you will have to be pretty careful about it. Adding a pair of stilettos won’t make your life simpler. Thus pick your most comfy heels! 6. Is there going to be a lot of moving around? Might seem like a minor thing, but wearing a sari totally depends on what the occasion is. If there is going to be a lot of running around then the saree might be a hindrance. Pick an occasion where you just have to stand or sit maybe dance a little too. Once you are a champ at it, you can wear it whenever you want. For now, though, pick the occasions wisely and get it tied properly! 7. Make sure the length of the pallu and the edge of the sari is appropriate! A sari with a heavy pallu (embroidered or embellished) might start hanging too much, and if it’s not pinned well it might start bothering you. Also make sure the sari length ends at the right place. Shouldn’t be touching the ground and shouldn’t reveal your feet too much either. 8. Take help from someone! We all have our moms and parlour-wali didis to help us with this. They are the actual experts at this, along with Youtube. You get better with every time that you wear a sari and you’ll know the little tricks and hacks with experience. Take all the tips and help from someone who wears this often, and then you can even experiment with new drapes and styles! 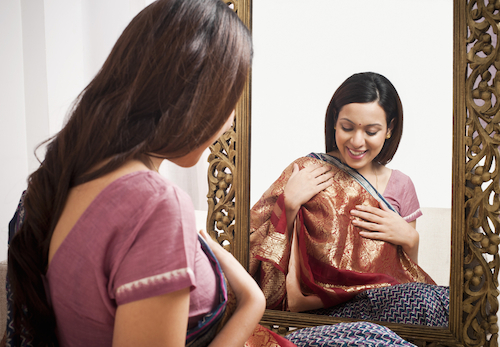 Images: Shutterstock MUST-READ: 10 Amazing (And Different) Ways To Style The Same Old Sari! MUST-READ: #BollywoodStyle: 6 WOW Sari Blouses You Need To Get Stitched!